With GDPR fully enforceable, there’s one topic on the top of every email marketer’s minds: the opt in. A good, and legally compliant, email marketing strategy revolves around the opt in. No one likes, with good reason, to get bombarded with emails from someone they don’t know. The email opt in is more than a legal and courteous practice, it’s also a serious opportunity for you to set expectations for your audience and start tailoring emails to what’s most relevant for your new subscribers. So what’s the fastest way to find out what content is relevant to your audience? That’s where the email preference center comes in. The email preference center allows your subscribers to select the type or frequency of content they receive from you. Do you have different product or service groups, industries, or geographic areas with different content streams? Do you send separate newsletters for events, webinars, company updates, or tips and tricks? Do you send at different frequencies that you could split into seperate email lists (daily, weekly or monthly sends)? 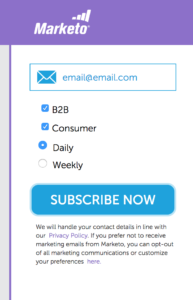 Example email opt in from Marketo. Map out the various types of messages you send, and the different ways you personalize that information to specific personas or locations, and then simply give your audience the option to self select the content they’re looking for through an email preference center. It’ll make your job easier, and ultimately be a better experience for everyone involved. The email preference center shouldn’t only come to play in your opt in process. Just as important as allowing subscribers to tailor emails when they opt in, is allowing them to personalize the comms they receive when they ask to opt out. Legally, of course you need an unsubscribe link in every email you send. Using the email preference center in the unsubscribe step is your last chance to talk directly to your audience and say, sorry we missed the mark here – are you interested in any of these other topics? Or would you like us to lower the frequency of emails and stay on our email list? The email subscription center in the opt out process helps to combat the flash unsubscribe, when the reader gets one irrelevant email and fully unsubscribes from ALL emails from your organization. With an email subscription center, your audience can simply unsubscribe from the topic or frequency that’s not working for them anymore, and keep subscriptions to the topics that are, so you don’t lose out on that subscriber! Need help mapping out your opt in or opt out process? Have questions about how to build a better email preference center in Marketo? We can help, just reach out!